Back in the early 90’s, I stumbled upon a Marlboro Adventure Team Gear catalog, and saw the tents, grills, etc., and remembered always seeing packs of spent Marlboro’s lying around on the ground everywhere. I kept the catalog, and hunted around for a couple of months for these (and from my own as I started smoking about that time as well). After 180 found or used packs later (at 5 miles per pack), I had enough miles to get “Old Faithful”. Not really shown above, as it is from the Legacy Tobacco Documents Archive at UCSF – it is a terrible scanned copy. 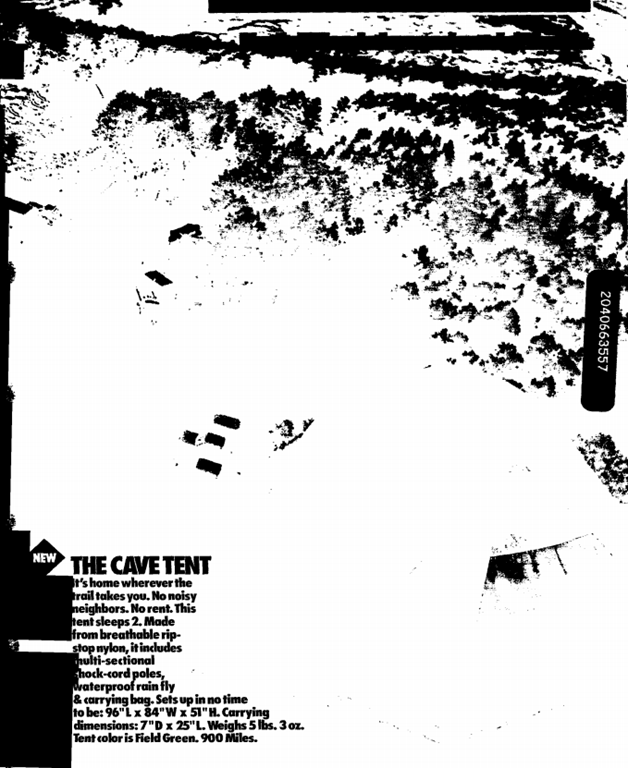 However, it was the page, back in ‘93, that got me wanting this tent. A recent picture of it pitched in the backyard is below. Fast forward 20 years – I still use it. The fabric around the seams is only now just starting to go, and I lost the rain fly many many many moons ago. 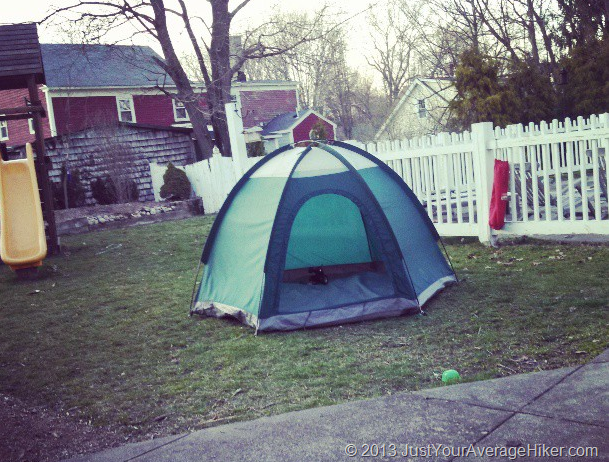 But, when I go car camping with my son, or, by myself – this is my go to tent. Or, BK (Before Kids), my wife and I used this almost every other weekend. I also managed during that same era, because my mom smoked Winston’s, to get the Winston Rewards Hibachi Grill… also still have and am still using it today. Hundreds of car camping trips later, these are still holding up. So, it wasn’t Camel Joe for me… it was gear that got me into smoking as a wee lad, go figure 🙂 I still have the gear, even after quitting smoking close to 10 years ago. This entry was posted in Camping, Gear, General Nonsense and tagged black lung, camel, camel joe, camp, camping, cigarettes, marlboro, smoke, smoking, tent, tenting, tents, winston. Bookmark the permalink. I’m picturing a marlboro duffel bag right now, and I don’t remember who had it. But I sure remember the days of camel cash savings and all the red and white marb gear, windbreakers, etc. Sweet story of a beloved tent! Thanks! I loved those gear catalogs… think I might need to go on an eBay kick and get some of the old stuff!